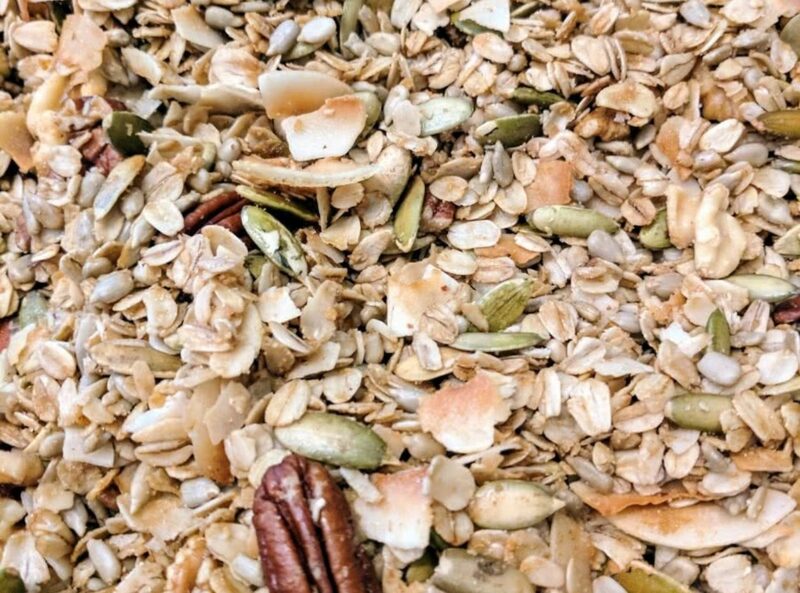 This granola recipe hits the balance between sweet and salty and provides a great texture to mix into yogurt or to eat on its own. The melody of of the unsweetened coconut chips that are roasted to perfection with the underlying crunch from the nuts and seeds lightly sweetened with maple syrup and brown sugar ensures satisfaction. Anytime we stray to another granola recipe, we find ourselves coming back to this tried and true standby. Any nut would truly work here, we have successfully tried walnuts which were delicious. Ovens obviously vary from household to household, but our granola bakes closer to 30 minutes. Make sure to keep an eye on the granola towards the end as the coconut can toast up alarmingly quickly. Make sure to stir it frequently and turn over the granola as much as possible for even baking. The granola is close to finishing when it no longer looks wet and shiny. We use a Silpat (link below) non-stick baking sheet versus parchment paper for an easy cleanup. This recipe is very forgiving, so do not stress that the amounts are not in grams, it is a very simple ratio of ingredients to get to the final product.